Taskmaster is on the loose and taking on all of the heroes in New York City - including The Unbeatable Squirrel Girl! 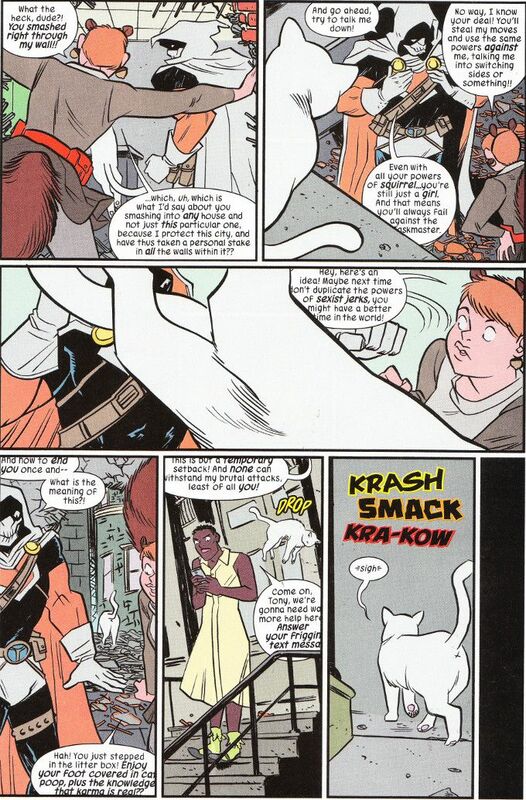 This is the story of what Mew - Squirrel Girls roommate Nancy's cat - does while an epic battle between Earth's Mightest Heroes and Villainy's Greatest Copycat occurs in the background. The Unbeatable Squirrel Girl is one of the best books to come out each month. That said, I think this issue may have set a new gold standard. The script by Ryan North offers a different kind of humor than we normally see on this title, more dependent on visual gags than the usual witty dialogue. Erica Henderson and Rico Renzi produce their usual stellar work on the main story, with Michael Cho providing the pictures for the Super-Villain Guide Cards and Zac Gorman, drawing the comic-strip-style sequences in which Mew dreams her wordless cat dreams. If you like comics that are just plain fun, you should be reading this!